The National Notary Association is increasing its benefits for members through enhanced Partner Programs that offer significant discounts and savings with participating organizations. 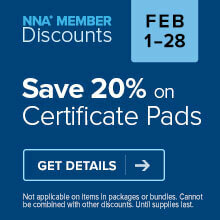 NNA members can now take advantage of special new discounts on a variety of products and services from companies such as FedEx, OfficeMax and LegalZoom. Members will receive steep discounts on prescriptions and car rentals, get help with debt collections and cut their energy bills. The programs are continually being updated with new partners and savings. For more information or a complete list of partners, visit the program’s web page or call 1-800-896-6827. I tried to use the www.bitly.com/NNAMemberdiscounts using FedEx and the site says it does not exist...could you share with me where I can go for the discount schedule and how to sign up? Hello, You can follow these steps to access the FedEx discounts: 1) Log in to NationalNotary.org 2) Click on “Member Benefits” from the left menu 3) Click on “Partner Programs” from left menu 4) Click on “Business” discounts The FedEx program is the 6th item listed. Please let us know if we can be of further assistance. Have a great day! Where can I find a list of partner discounts? Hello. Log in to your member account at www.nationalnotary.org. On the "My NNA" page, click on "Partner Program Discounts" in the "Member Quick Links" section on the right side of the page.